Programs are known to be an integral part of any event. They provide an outline of activities that will transpire throughout the course of an event to keep participants informed. But like any other communication medium, programs need to developed correctly in order to serve a desired purpose. So in this article, let’s look into the basic parts of an effective program along with some useful tips to help you create your very own program with ease. 1. 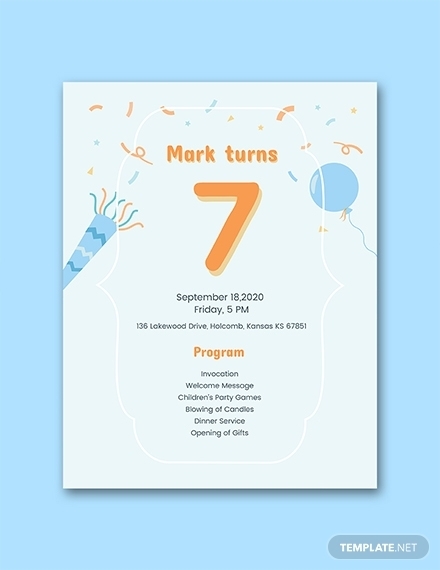 Event Details: The name, time, date, and location of the event are the four basic components that every program should possess. This must be spelled out clearly in the program to avoid any confusion. Since the program is likely to be distributed some time before the actual event, last-minute changes are impossible to avoid. If this happens to affect the specifics of your event, a formal announcement should be made in advance. 2. Logo: An event logo, or one from the company behind its production, is often utilized for branding purposes. This is positioned at the top of the program’s front cover or as a backdrop of each page layout. This is a key part of the program that should complement the rest of your text and design elements. 3. Contact Information: Regardless of how detailed your program may be, a few matters may still seem unclear to some people. Participants might even have a few questions and concerns that they’d want to raise. To address them, you need to provide your audience with a means of contact. This includes your phone number, email address, social media handles, and website URL. This will make it easy for participants to get in touch with you before and after the event. 4. FAQs section: Respond to common questions from attendees by including an FAQs section in your program. 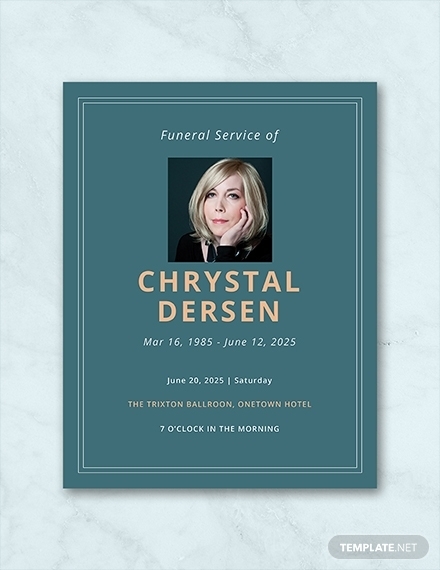 Though this may not be necessary for birthdays, weddings, and funerals, you’ll probably need one when hosting larger functions such as seminars and conventions. These FAQs can cover concerns regarding the time duration of the event, attendance details, the basic amenities accessible to guests, and other possible questions surrounding your event. 5. Map: Not everyone will be familiar with the exact location of your event venue, especially if it’s at an area with very few landmarks. Though a GPS system would be an obvious solution, only several of your guests would have access to one. Providing directions might also seem like a good option, but there are many other factors that will make it difficult for people to locate your venue while on the road. Thus, creating a small map of the area leading to your venue will be a better alternative. 1. Identify your purpose: The contents of your program will likely vary depending on the type of event you are holding. 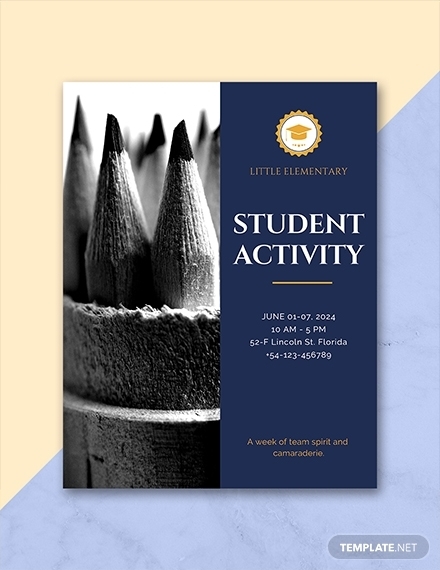 If your purpose is to offer participants a brief description of each activity, then a program in the form of a brochure might be an appropriate option. The panels of the brochure give you enough space to convey your message in a clear and detailed manner. Otherwise, you might want to use a single-page program as a money-saving approach. 2. 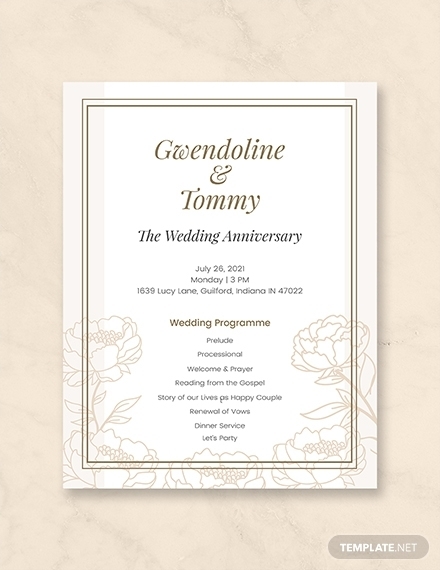 Select a template: The great thing about using a template is that you no longer have to worry about adjusting the format of your program to meet pre-printing requirements and your personal preference. 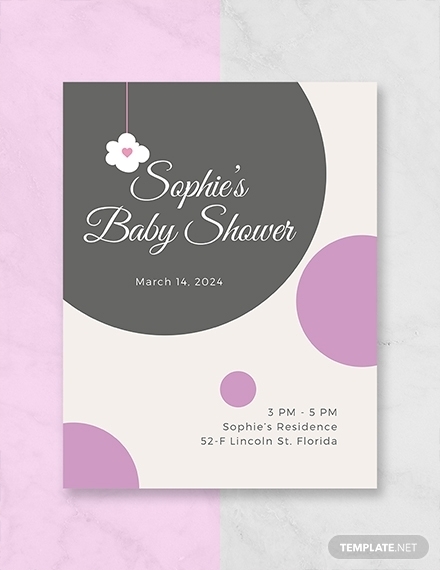 The template also contains a pre-designed layout that you can use or customize to your own liking. It’s important to choose a template that best suits the theme of your event to give participants a memorabilia that they can keep. 3. 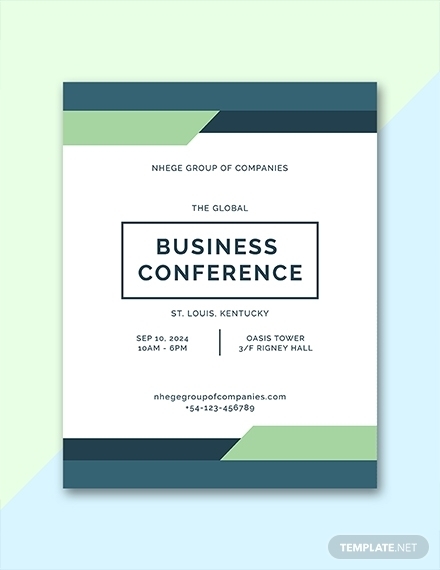 Fill in your content: Fill the program with texts and images that are pertinent to your event. This includes key information about the event, additional details that attendees might be interested in, as well as relevant photos or illustrations that support your message. Say for instance, if you’re hosting a local convention for young entrepreneurs, then you can include images from your previous functions or use stock photos that suit the part. You may also see program agenda examples. 4. Edit and print the program: Don’t forget to proofread your entire program and apply the changes when necessary. Once you’re satisfied with your content, you can move forward to the final step of the process. Unless you plan to upload it online, you need to choose a paper stock and finish for the physical output of your program. It’s best to choose something that is durable and of high quality. That way, you can minimize the likelihood of tears and crumples from affecting the appearance of your program. 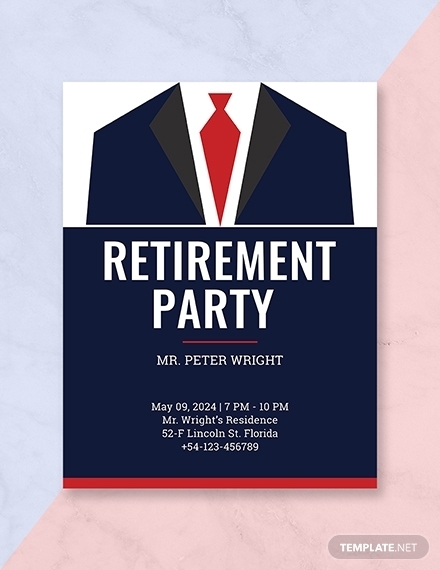 You can also have these programs produced in bulk by a professional printing service for better savings. 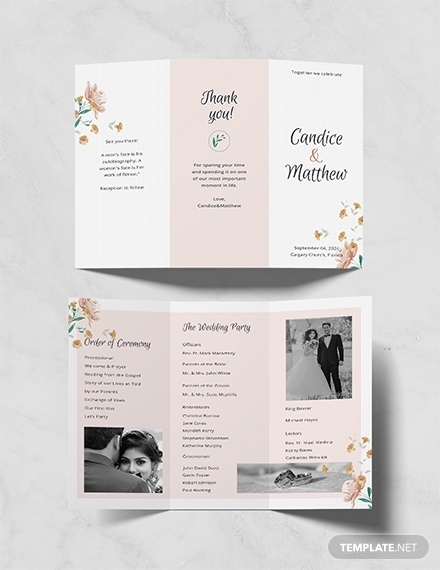 Design for your audience: Simple yet creative layouts are best suited for formal ceremonies, while vibrant and colorful designs will cater social gatherings just perfectly. You need to center your design on the needs and interests of your audience for it to effectively serve its purpose. Thus, it’s important to consider what participants might expect to see on your program before you begin drafting the layout. 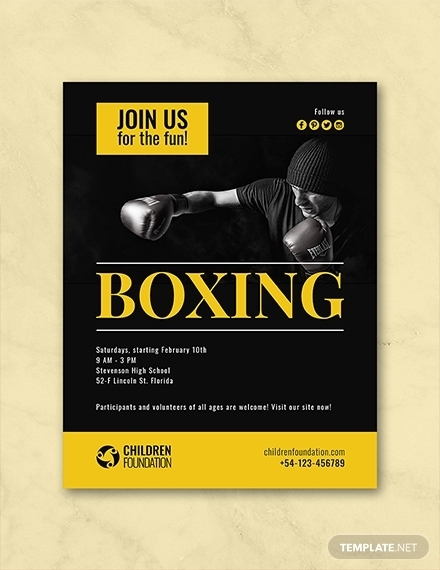 Make it creative: Increase the visual appeal of your program by adding graphics to your layout. You can apply various patterns and styles that will draw attention from your readers and boost engagement. 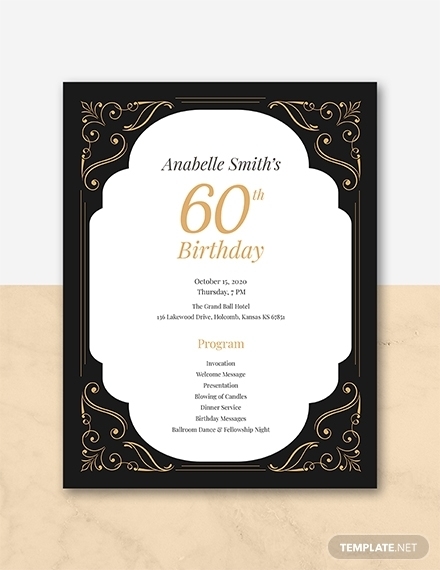 Be sure to choose something that is appropriate for your event and complements the overall theme of the program. Group related information together: There are a few things that people will want to take away from your program. This includes the event name, date, time, and location. These components should always be sectioned in the same area to make it easy for participants to find what they are looking for. You can also list these details in separate lines to maintain a clean layout. You may also see program management examples. Keep it readable: It’s important to make your text elements as legible as possible. Choose a font style and size that can easily be read from half an arm’s length so participants won’t be forced to read the program for the nth time just to make sure they read it right. 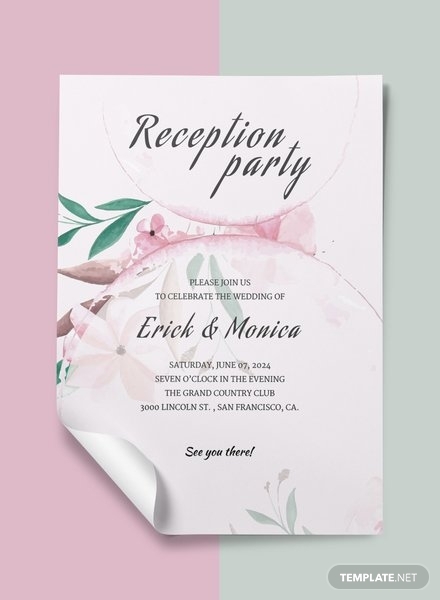 Use special paper: You might have noticed how wedding programs are always fancy. 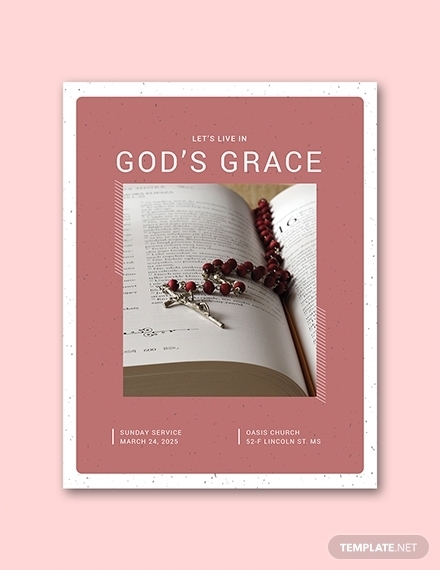 Some are printed with a glossy finish, while others with a scented paper stock. 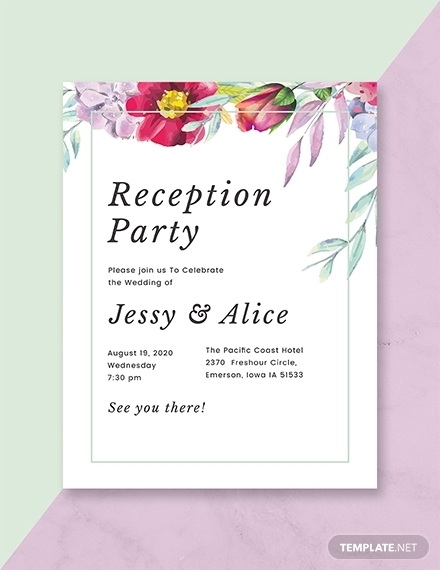 Although this usually depends on the kind of event you’re hosting, investing a reasonable amount of money on good paper will add to the aesthetics and mood of your event. In fact, this might even encourage people to take good care of your program until the end of the function. Seminars and Conferences: Organizations often host these events with targeted audiences to provide them with relevant information about a particular subject. Seminars and conferences usually last a couple hours (or days) longer than a normal meeting. Thus, having a program might come in handy for participants to know what to expect at the event. Executive Retreats and Incentive Programs: These are events that typically last for three to five days due to the long list of activities that need to be covered. Like a travel itinerary, the program of these retreats informs readers of the tasks and activities to be carried out at a particular location, time, and date. Despite its business-centered objective, the program also focuses on other affairs that participants can enjoy. Business Events: Training courses and orientations are common programs designed to help in the growth and development of company employees. Since these events may last between a day and a week, it’s important to create a program that relays the flow of activities for participants to be aware. 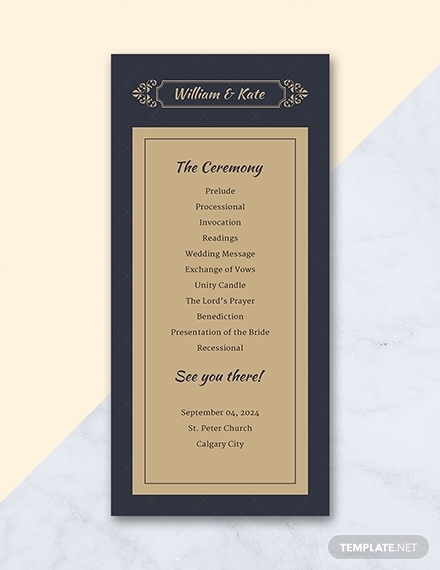 In most cases, these programs are simply printed in a single page to make them convenient to carry around. Weddings: A wedding celebrates the sacred union of two individuals. Most couples like to make the most out of the celebration by hosting a reception right after. Wedding receptions usually last for a few hours to cover a number of activities that attendees may engage in. 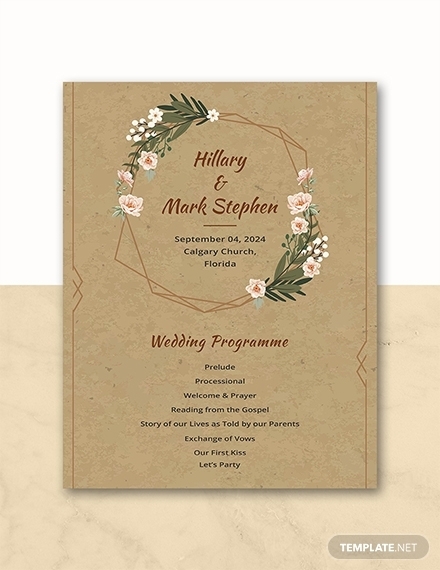 Though weddings are always full of surprises, wedding programs are often handed out before the ceremony to keep guests informed. 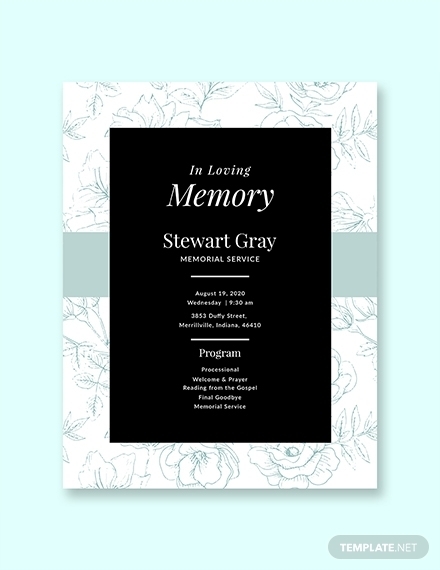 Funerals: Also known as a memorial program, these are used to commemorate the life of a dearly departed. 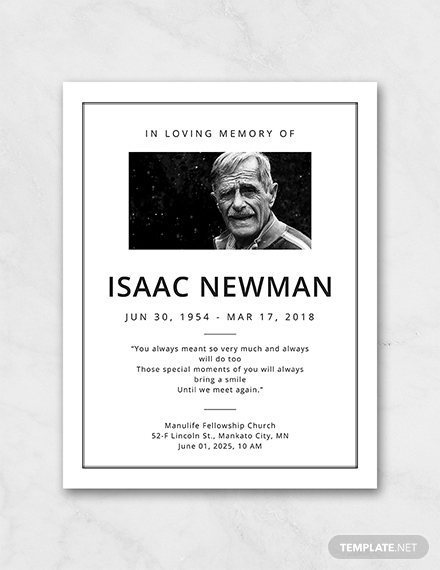 It can come in the form of a funeral brochure or a tiny booklet, depending on what you plan to put. 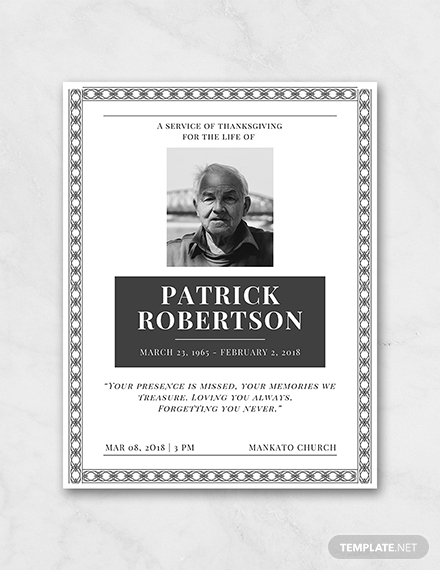 The program may talk about one’s passing, information about the life they lived, along with details regarding their funeral service. A program is known as a plan of action designed to accomplish a defined business goal by identifying the work that needs to be done, by whom, when, and what resources will be used to meet these objectives. It also contains a schedule of activities that will transpire throughout the course of an event. This is specially catered toward company training programs, conferences, workshops, award shows, weddings, and other events. What is included in an event program? 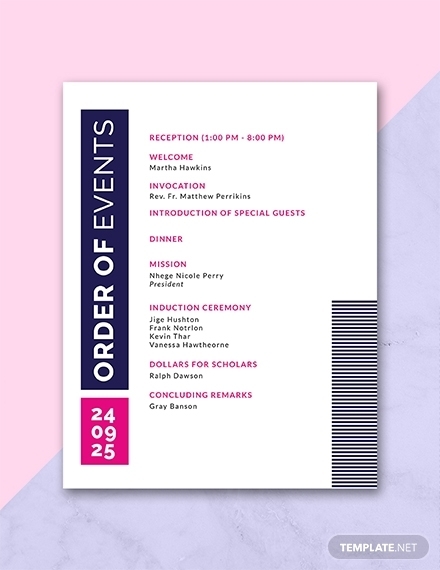 For many functions, having a classic paper program can come in handy to communicate highlights of your event and keep attendees off their phones. 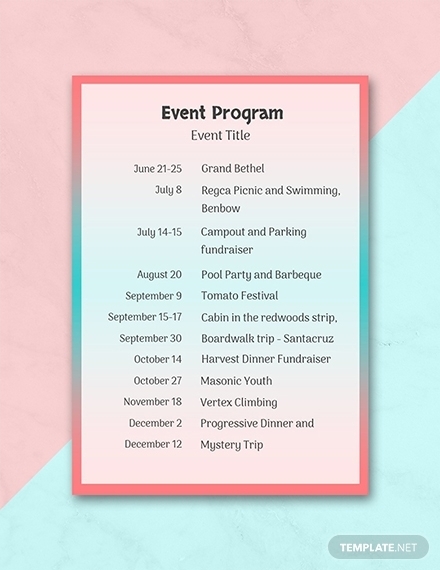 An event program is typically comprised of your event name, date, and location, as well as your company logo, social media handles, and website address. It should also contain a time schedule for shows, group activities, and individual sessions throughout the day. This will guide participants around the venue and keep them fully informed. We hope you found this article helpful for when you need a program to communicate the flow of your event. Feel free to use the templates provided to save on time and effort.